Posted on April 5, 2016 . 29 Comments. “Begin at the beginning,” the King said. 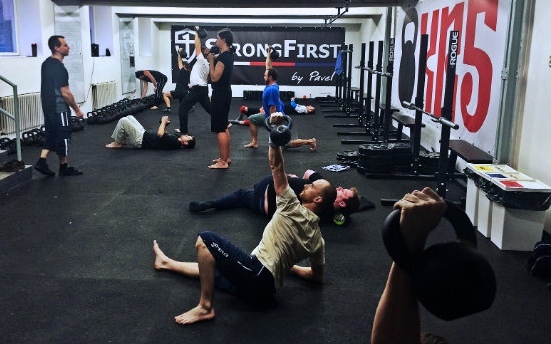 I would like to add, “And then don’t stop.” The following article gives a blueprint of how we do exactly that for our beginners’ group lessons in our StrongFirst-powered chain of seven gyms in Czechia, Europe. In exactly the same way the program at large requires progression from one element/exercise/weight to another in a logical order, so does each individual lesson. Each sixty-minute lesson is a reflection of the structure of the program as a whole, only in miniature. Through this greeting, everybody is awakened and energized for the practice to come. The students love it, and it helps build a sense of purpose and community while setting the tone. Last but not least, it pays respect to our Alma Mater, StrongFirst. If a student comes late, he or she will get a special motivational work-in—if the student doesn‘t swing yet, they are assigned ten minutes of crawling. If he or she can swing, then the work-in is 10×10 two-handed swings with 16+kg (or 12+kg for women). If the student can swing and do the goblet squat then the assignment is: 10 swings and 10 goblet squats, 10 swings and 9 goblet squats, 10 swings and 8 goblet squats…up to 10 swings, 1 goblet squat. If students don‘t like this, then we gently suggest they join a mirror-and-fern-laden health spa where the instructor apologizes to them if they come late. And what if the instructor comes late? Same thing—swings, only with a heavier bell. We are egalitarian that way. The warm-up serves not really as a “warm-up” per se, but rather as an undoing of the chair-like posture so many of us are heir to from sitting at our computers all day. This is done through some intelligent and focused movement-prep consisting of foam rolling, corrective stretching, Original Strength resets, and kettlebell movement prep. After around one month of training with us, once the students have learned all the drills above correctly and remember them, their warm-up consists only of Original Strength resets and/or kettlebell movement prep. Foam rolling, stretching, and mobility work becomes their homework. If needed, students can foam roll a problematic part or do corrective stretches during the rest time on the training lesson. As the old saying goes, “If it ain’t broke, don’t fix it.” Most students just do Original Strength resets or Fast & Loose drills during the rest periods to keep fresh, moving well, and ready to attack the next set. Note: After the students learn this sequence, this too becomes their homework. They don’t stretch at the beginning of a class—they stretch after the lesson or at home. Breathing, head nods, rolling, rocking, crawling, marching. Move! Deadlift, suitcase deadlift, single-leg deadlift: Mainly as progressions leading to swing, two-hand swing, and one-hand swing, which are the main hinge/lower pull goal. Foundation for cleans, snatches, barbell deadlifts, etc. Sets of 5-10. Naked get-up, half get-up and finally the full get-up and its variations: A loaded reset that deals with asymmetries and serves as the foundation for all overhead lifts. 5 singles each side. Hollow position progressions to hollow hang: As taught at the SFB Course and Cert. Goblet squat: We teach prying goblet squat right in the beginning, but save the actual squatting for later weeks so the students don’t confuse hinge and squat. We are not concerned that much with the weight in the early stages, but on emphasizing the correct movement pattern. As Pavel said at our SFB Cert, “Not everybody needs to squat heavy, but everybody needs to squat. Goblet squat is the squat for everybody.” After demonstrating competence in the two-hand swing, the students start to squat as well, ordinarily for sets of 5. Push-ups: SFB plank to push-up progressions. We don’t go over 15 push-ups. When the student can perform 15 push-ups, we put him on heavy floor presses instead. In floor presses, students work on 3-5 sets of 3-5 reps short of their max. Now that we’ve detailed each individual part of the lesson, it’s time to take an eagle’s eye view of the layout of the skills and how they are paired together. 5th Element: Get-up, 5 each side. The students add the weight following the Simple & Sinister sandwich method. Hinge + upper body push: Alternate deadlift and its variations (5-10 reps) and push-ups (max rep minus 2-3, i.e. not to failure, but not more than 15 reps) or floor presses (sets of 3-5). Note: Don’t be obsessed with doing everything. The most important part are the get-ups. If the student doesn’t know some of the drills, it‘s not a problem. Have them do what they know. If you don’t go through all the movement patterns, this is similarly no problem at all. Like a Chinese herbal recipe—you need just the main ingredients—if a few of the minor ones are missing, it still works. Beginning students don‘t need to go heavy early on. Let them concentrate on proper movement, good technique, and active rest (Fast & Loose, Original Strength resets). Heavy will come with time. Whatever you do, don’t allow the class to degenerate into circuit training. We have finally arrived at the last ten minutes of class. As you can imagine, this is where the students “go ballistic,” particularly with the help of the swing. Crawling regressions and progressions, like baby crawl and leopard crawl. When the students already know suitcase deadlift, they practice suitcase carry or farmer’s carry, or alternate crawling and carries. When they can finally swing—they swing! First they focus on two-hand swings, and later, when their two-hand swings are perfect, they do the one-hand swing and occasionally other variations (power swing, hand-to-hand swing). Do 10 swings every minute for 10 minutes. The aim of the beginner’s swing protocol is excellent technical precision and maximum explosiveness, not blood-and-guts high-rep sets. Everyone needs a goal to shoot for. While individual strength and athletic goals may vary, these are the benchmarks we set for our students to help support any other long-term goals they may have. All are achievable with time, patience, and perseverance. 5 get-ups each side—ladies with 16 kg, gentlemen with 32 kg – in 10 minutes. One-hand swings 10×10, in 10 minutes—ladies with 16 kg, gentlemen with 24. Hollow chin-up/pull-up hang—ladies 30 seconds, gentlemen 45 seconds. We are a school of strength and conditioning, not an amusement park. If the students are strong and in shape, we all do our job well—hence the standards. Note: There is no need to wait until the student fulfills all the requirements before teaching new drills, e.g. when they can do a good hollow hang, they start to work on their chin-ups/pull-ups. If the student can perform one-hand swings well, he or she can start to learn the clean and different swing protocols (first building up the reps, and later restarting with lower reps again but heavier weight). If the student‘s goblet squat is good, he or she can start to work on the front squats together with clean practice. If the students can perform 5 get-ups per side with 32kg (or 16kg for ladies) and 15 push-ups (10 for ladies), they can start to work on the military press. Encourage the newbie to join in the group, and try to follow what they see during the warm-up. Let them know not to worry, that later you will work with them individually. After the warm-up, give orders to the group, and take the newbie to the side. Explain what the aims and benefits are in the lesson. Show them the first stretch and let them practice it. Later, show them the second stretch and have them practice both stretches one and two. Later, show them the third stretch and let them practice all three together. You can leave stretches four and five for the next lesson. There’s little chance they will remember all five stretches. Moreover, no one is going to get excited about stretching for a whole hour. Explain the basic resets—especially the diaphragmatic breathing, head nods, and rolling, as well as their importance in building a base for their future success. Teach them Fast & Loose drills. During the last ten minutes of class, have them do the baby crawl and/or leopard crawl. This is a win-win approach because the students get what they need (correctives and restorative exercises) and what they want (“exercise“ in the form of 10 minutes of crawling, which is humbling for everybody). Most important of all—no harm was done! They need to have a clear overview of the game plan for next few lessons, weeks, or months. They need to feel they got in a workout, i.e. the student didn’t just do boring correctives – hence the crawling. They need close attention, but not babysitting. They require clear commands of what to do in an exercise—”Alternate left and right leg until I come back to you in few minutes”—and what to do in the rest periods—Fast & Loose drills. One hand swing, floor press. 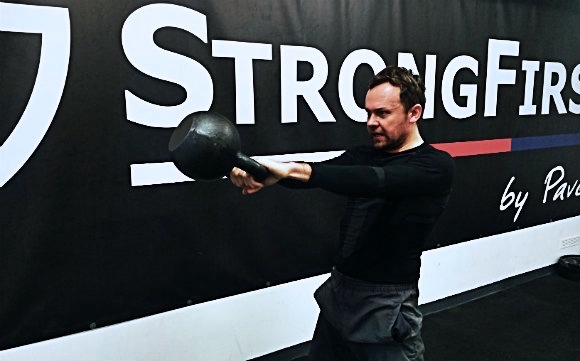 After they fulfill all the requirements listed above, most of our students move on to our SFG Course program (press 1–swing+goblet squat–press 2), Rite of Passage program, or basic kettlebell plus barbell program (Kettlebell + Deadlifts Part I). Safety first. Have standard operating procedures, i.e. enough space around when doing get-ups, nobody in front when swinging, one man-one bell only (unless the student is doing a double bell program), etc. Ensure each student knows and understands. Do no harm, don’t hurry, and have a progression/regression for everything. Students must have a training log and carry it with them to class—this is non-negotiable. Train to success, not failure. Change the mindset. 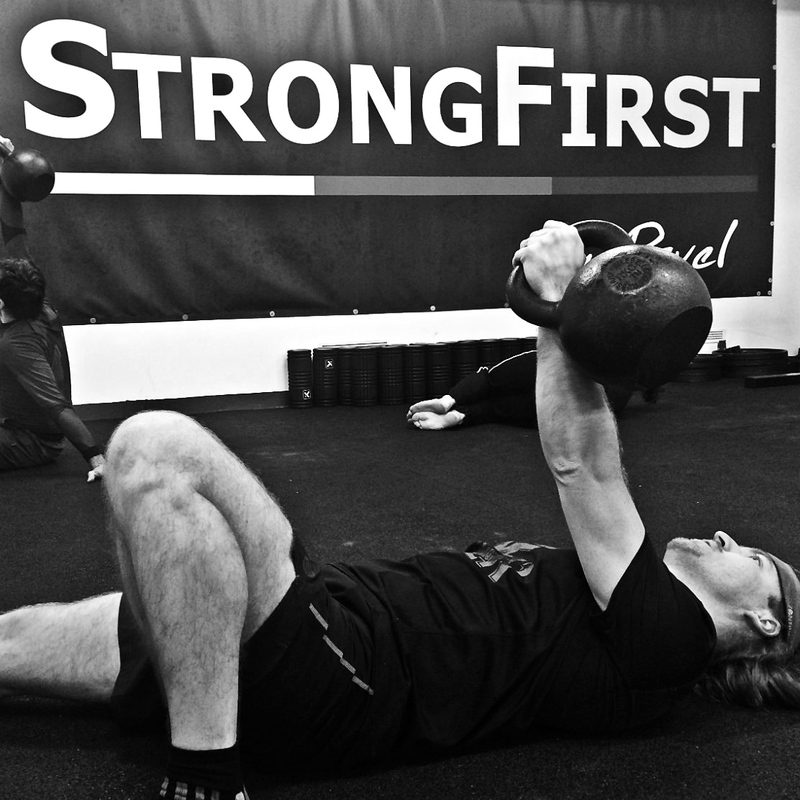 You are not a personal trainer with clients—you are StrongFirst instructor with students. Make sure they do their homework! “What if I don’t have any kettlebell or pull-up bar?” they will ask. The answer? “Get them.” Meanwhile, they can still do get-ups with a shoe, mobility squats, hollow position floor progressions, crawling, and stretches. Something both you and the students should practice. Don’t be afraid to be StrongFirst. All the equipment we have is kettlebells, pull-up bars, power racks, and barbells. We completely ignore all fitness trends, and do what we have learned from our StrongFirst teachers—and we are very successful. No trial, no error—just a system, a plan, and results. 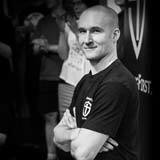 Pavel Macek, Master StrongFirst Instructor, founder and chief instructor KB5 Gym, is a pioneer of kettlebells in Czechia, Central Europe. He began training Chinese combatives in the Hung Kyun style in 1991, studying in the USA, Hong Kong, and China. He is president and chief instructor of the Practical Hung Kyun International Association. Pavel was the first StrongFirst Certified Instructor in Czechia. He is also an FMS/CK-FMS specialist. In 2008, he opened the first kettlebell gym in the Czech Republic, KB5 Gym Prague. He currently teaches Chinese combatives and MMA (Practical Hung Kyun), strength training (KB5 Gym Prague), and tactical self-defense for various private and government agencies, as well as Prague’s Charles University. 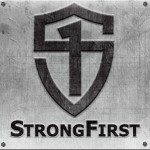 Please check out his English blog SIMPLEXSTRONG, his Repeat Until Strong training log on the StrongFirst forum, and his StrongFirst articles. I have a question about the pairing of exercises. On get-up it says “Get-up, 5 each side. The students add the weight following the Simple & Sinister sandwich method”. I have read the sandwich method but is un-clear how this work for get-up for this 3-month plan. How does this work? 1 get-up beetween sets of everything else? Then proceed to other exercises, e.g. single-leg deadlifts and pushups. Immanuel, I learned them at the various StrongFirst and FMS certs. I may do a video of them and upload them to our StrongFirst Czechia YouTube account if you like. Somehow I had not read this before, but rest assured, I will read it again and a third time, if not more, to try to understand it better and remember some of the details. Any questions you have, let me know, Steve! Simple, effective. Nice work. A kettlebell (or 3) a pull-up bar, a barbell and your bodyweight. Simple programming and equipment, sinister results. The way we do it in StrongFirst! Nice write up! very informative. Wish there was place like this near me. Thank you Alex. Check out our instructors page, there might be an SFG instructor nearby! Are you teaching floor presses with a barbell or Kettlebell? 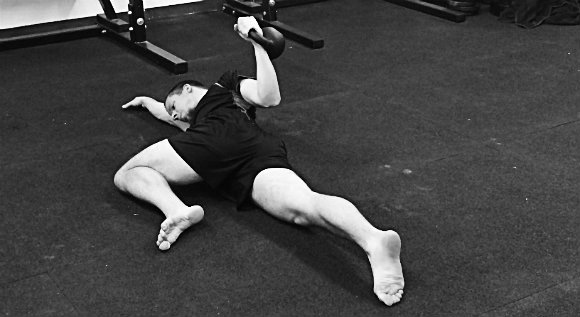 Trapp, kettlebell, and later with barbell – either floor press, or bench press. Wondering how many days a week your students train? I seem to be having a hard time progressing in S&S without developing some tweaks. Right now 1 on 2 off seems to be doing well. Shawn, 2-3 times a week. Of course, they get homework . If they do not own a kettlebell (yet), even shoe get-up and hip hinge helps! Very thorough and detail oriented. I love this article and information. Best blog in a long time. Thanks to everyone who worked on it! Thank you James, I am happy you like it. top article from a top instructor! Thank you Francesco for your kind words. I agree with Alex, required reading. Thank you Pavel for your sharing such an important piece on programming essentials. Thank you Scott for your kind words. I am looking forward to see you again! Awesome to see this article finally hit the light of day! It was even better reading it this time around now that I can more fully grasp both the simplicity and the intricacy involved in this approach. Congrats again, brother! Keep up the strong work in building the next generation of StrongFirst instructors! Thank you Aleks for your kind words, and thank you for your help and proofreading. See you soon brother!